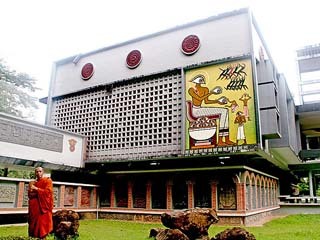 This page provides information about the main Suan Mokkh mon­as­tery, its founder Venerable Buddha­dasa Bhikkhu and the Buddhda­dasa Indapanno Archives (BIA) in Bangkok. BIA provides the teachings of Ajahn Buddhadasa, mainly free of charge, as downloadable media in different formats (e.g. audio, pdf) in Thai and English language. Wat Suan Mokkh is a forest mon­as­tery where about 40 monks live in little huts in the forest. From July to September, during the tra­di­tion­al three month rain retreat, the number of monks may increase to more than 70. Another part of the mon­as­tery grounds is re­served for nuns and lay women. At one time, before 1996, a small community of for­eign­ers lived at Wat Suan Mokkh, known world­wide as a centre for med­i­ta­tion. Today only oc­ca­sion­ally for­eign­ers will stay longer than two or three days before or after the retreat at the associated In­ter­na­tion­al Dharma Her­mit­age about 1.5km to the east of the main mon­as­tery. This hermitage attracts more than 1,000 for­eign­ers a year to Wat Suan Mokkh, which some­times appears as Wat Suan Mok in some publications and web­sites that try to cap­ture the pro­nun­ciation. The visitors attend 10-day silent retreats with instruction in med­ita­tion and Dharma. The instructions at the In­ter­na­tion­al Dharma Her­mit­age are given in English. There are a number of other buildings at Wat Suan Mokkh, including the Spiritual Theatre and the assembly hall in the form of a big ship - a metaphor for the Dharma - with a foreign library and the sculpture work­shop. The foreign library has a variety of books on med­i­ta­tion, Buddhism and related topics in many languages including English, German, French and Japanese. Anyone arriving early for a retreat, wanting to stay longer or arriving during re­treats is wel­come to stay, ini­tial­ly for up to seven days, at the main mon­as­tery. If, after seven days, you intend to pro­long your stay, you need to get per­mis­sion by the abbot of Suan Mokkh or his rep­re­sen­ta­tive. Per­mis­sion will readily be granted to dedi­cated medi­tators and students of Buddhism. Doing a chore (com­mu­nity work like sweeping leaves) while staying is part of the practice. Ac­com­mo­dation in dorms (for men) or in­di­vid­ual rooms (for wom­en) is free; food is avail­able inside the mon­as­tery or at the nearby stalls. Please note that there are neither organised activities nor a certain schedule to be fol­lowed, no teachings or instructions been offered while staying at the main Suan Mokkh mon­as­tery. This possibility is there­fore most suitable for people who have done a retreat at the In­ter­na­tion­al Dharma Her­mit­age already or for experienced med­ita­tors who can use the wat's facilities without guidance. Staying at the main mon­as­tery provides an in­ter­est­ing op­por­tu­nity to get in touch with the monastic lifestyle of forest monks in Thai­land. It is not necessary to dress in white and you do not have to keep silent while staying there but you are asked to dress and behave re­spect­fully and to keep the Eight precepts as described in the Basic Rules page of this website. Buddhadasa Bhikkhu (Slave of the Buddha) became a monk 1926 at the age of 20. He founded Suan Mokkh (The grove of the power of liberation) in 1932 and moved it to its pres­ent location about 10 years later. "His goal has been to produce a com­plete set of ref­er­ences for present and future re­search and practice," says the About the Author section in his many printed books. "He has studied many schools of Buddhism as well as other major religious traditions. He seeks to unite all genuinely reli­gious people in order to work together to help free hu­man­ity by destroying selfish­ness." His last project was to establish the In­ter­na­tion­al Dharma Her­mit­age where people from all over the world study the 'Truth of nature' and engage in mental cul­ti­va­tion or medi­tation. 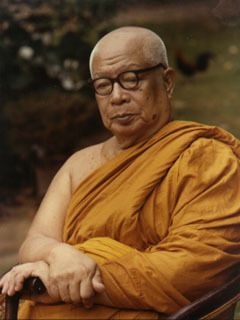 Ajahn Buddha­dasa died at Suan Mokkh on July 8, 1993. He was 87 years old. His books, some translated into English, skil­fully explain Anapanasati medita­tion and other aspects of the Buddha's teaching. Eight audios on Anapanasati (Mind­ful­ness with Breath­ing) incl. a sum­ma­ry of the whole system and the trans­la­tor's com­ments are avail­able at: Mindfulness with Breathing. The medi­tation instruction given through­out the retreats are excerpts from this audios. 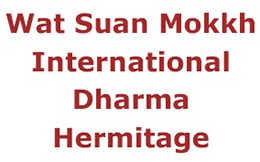 More information about Buddha­dasa Bhikkhu, about his trans­lated books and avail­able media in English is offered at BIA (see below) and at www.suan­mokkh.org. 730 hours of audios are provided here. This website was founded by Santikaro a former monk and the main trans­la­tor of Buddha­dasa Bhikkhu. Another former monk of German nationality has trans­lated some of Santikaro's English trans­lations into German. Please visit www.buddhismus-muenchen.de for details. Both, English and German trans­lations are available after the retreat in the retreat center or at the Dhamma­dana Foun­da­tion in front of the main mon­astery. 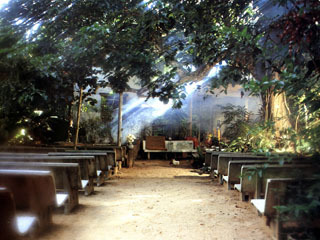 Postal service as well as download possibilities of his teachings are available via BIA-Bangkok. Buddhadasa Indapanno Archives (BIA) - "Suan Mokkh Bangkok"
The Buddhadasa Indapanno Archives, ad­join­ing a small lake just outside the north-western edge of Chatuchak park in Bangkok (see map below), is a new and modern build­ing dedicated to the heritage of the late Venerable Buddha­dasa Bhikkhu. 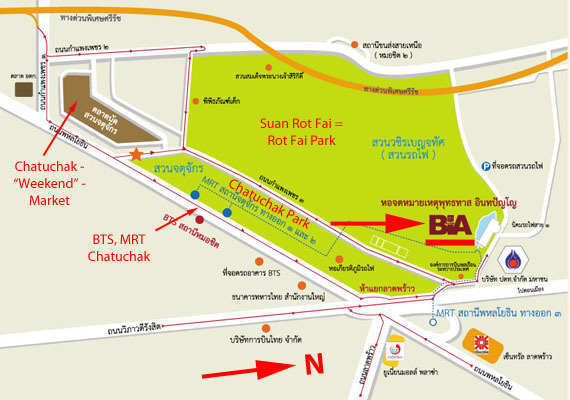 It is often referred to as "Suan Mokkh Bangkok".It hosts facilities suitable for medi­ta­tion, lectures, discussion, exhibitions etc. Beau­ti­fully decorated open air areas and a large bookshop with Thai and English language Dharma lit­era­ture are integrated as well. Ac­tivi­ties are being held regularly and a notice board gives information on other Dharma activities in and around Bangkok. Present ac­tivi­ties do not include medi­tation retreats. Most activities are in Thai but more English language ac­tivi­ties are in the making. At BIA the works of Buddhadasa Bhikkhu are collected and made available to the public in many different languages. The following websites provide the wealth of his teachings in form of videos, audios, tran­scripts, books, e-books and arti­cles. Here one can find his in depth-teachings on all the topics introduced during the retreats at the Inter­na­tional Dharma Hermitage as well as his own talks to the retreat­ants. The audios respectively tran­scripts are recordings of talks given by Ajahn Buddha­dasa to the retreat­ants at Wat Suan Mokkh. They are available for the years 1986 - 1991.